At Shortys HVAC Supplies we get many calls asking why we do not have our site set up so you can identify Carrier parts by the model number. Carrier Corp uses a variation of a model number to identify the parts used for a particular model. This is called the product or production number and it has several more digits than the standard model number. Every time a part is changed during the manufacturing process a digit is changed in the product number to specify which part was used. A specific model number may have many variations during the time it was used. We collect the product number and log into a Carrier database of all the production numbers and can see which parts were used during the manufacturing process. This is not a database that is readily available online. When we look up the product number for you we see the current part required for your application as well as any notes that have been added recommending any changes the equipment may need to complete your repair. By taking a few extra minutes we can many times prevent a problem you may have when making the repair. 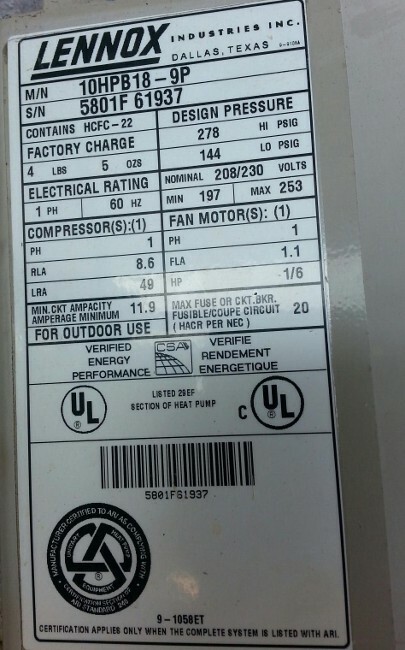 Your equipment will also maintain its UL rating and operate at peak efficiency. Here is a video we put on You Tube with some information about old style and new style contactors used in air conditioning equipment applications. This explains the differences and how to connect wiring to a contactor properly. Be sure and subscribe to our You Tube channel and let us know if you like us. Informational video for do it your self replacement of condenser fan motor. This video explains how to change the capacitor in an air conditioner or heat pump application. This unit is a Payne air conditioning unit. Payne is a brand manufactured by Carrier Corporation. Shortys HVAC Supplies is now working on a channel on You Tube. We have posted a few how to and informational videos and are currently working on more to post. We are posting information about various parts as well as how to troubleshoot and do your own repairs. Join us on our channel! 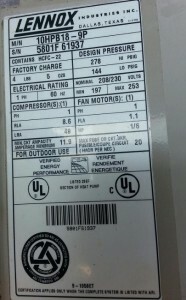 I have attached a picture of a Lennox Heat Pump tag for reference to show what we need to identify parts. This tag is for a model 10HPB18-9P. On this particular model the 10HP tells us this is a 10 SEER heat pump. The B means this is a series B. the next 2 digits are 18 and that tells us this is 18,000 BTU or 1-1/2 ton. The last part of the model tells us this unit is the 9th revision which means this model has had 9 different changes in parts used during the manufacturing process since it was released. This 10 seer 1-1/2 ton B series heat pump had 14 revisions before being discontinued. It s critical to have an accurate model number to look up parts. Please email us or give us a call if you need help identifying parts.